How can places help companies invest as well as grow? Business Attraction Management or BAM is a new approach to meet the challenges facing place-based investment promotion for cities and regions. As opposed to traditional sales and transaction-oriented investment promotion, BAM is a holistic approach to the strategies, processes and activities, aiming at attracting and making full use of inward investment activity. It also integrates the investment promotion efforts of the place with the general growth and innovation agenda. The cornerstones of Business Attraction Management are four phases, intercon­nected in a cycle. 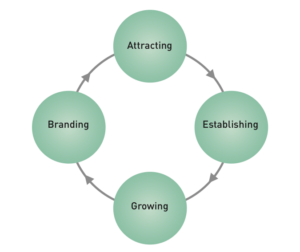 The phases are: Branding, Attracting, Establishing and Growing. Investment promotion as a discipline plays an integral role in Business Attraction Management. However, Business Attraction Management is a broader concept, not only focusing on attracting an investment and giving the investing firm due after­care, but also drawing on local and regional strate­gies and policies for making the place attractive to investment-led growth and innovation. As such, policies and strategies for innovation and growth, cluster development and talent attraction play an important role as enablers for business attraction.